The Las Brisas Retreat is running a cooking weekend in conjunction with chef Megan Rainnie of Gourmet Girl – on the Go and myAmanzi to learn new culinary skills and prepare delicious meals. The weekend will include 3 hands on cooking classes, copies of all recipes, a wine tasting, 2 yoga/Pilates and movement classes, nature walks, and the chance to relax, have fun and make new friends while surrounded by breathtaking wilderness. You will learn how to get organized in the kitchen, basic knife skills, great money and time saver tips, timing, mise en place, presentation skills for your dishes and table decoration ideas, all while learning to prepare scrumptious dishes. There will also be a Pilates and Wellness Retreat running the same weekend, so you will have the chance to join in with some of the mindful movement exercises and learn about how to nurture yourself. Participants from both workshops will enjoy all morning movement classes and meals together, in addition to Friday night’s cooking class. 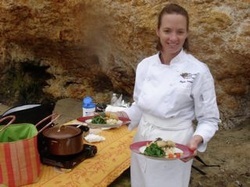 Megan Rainnie is a certified Personal Chef, member of the United States Personal Chef Association, and Graduate of Laguna Culinary Arts' Professional Chef School. Megan's seven years of heading up and teaching the corporate teambuilding program at Laguna Culinary Arts, and nine years of teaching her own cooking classes at the school (and privately) have honed her culinary teaching skills to adapt to any audience. "I learn from every group, and that is what keeps it interesting. I think you have to be a great chef to succeed, but when you are teaching, you have to be a good listener, and a good teacher." In addition to small group classes, Megan also has experience developing recipes and creating food and cooking demonstrations for tradeshow attendees, community festivals and charity events. Megan also formed "Gourmet Girl - On the Go" a catering company that handles events ranging from 2 to 275 people. Megan has catered for birthday parties, award ceremony sit-down dinners, Mother's Day brunch, BBQ Lunch Buffets, Luaus, corporate dinners, trade shows and more. Come and learn from her expertise.